The Auburn Tigers during UVA vs. Auburn on Saturday, April 6, 2019, in Minneapolis, Minn.
four for Doughty and a team-high six for McLemore — as Auburn out-rebounded the Cavaliers 20-14. Despite the lead, however, Auburn finished with a 3-for-13 clip from downtown in the first half to pair with 12-for-29 shooting from the floor. Jared Harper and Brown combined for seven points on their own — four and three, respectively — while combining to shoot 33 percent from the floor. Harper finished with 11 on the night as Brown added 12. Former Auburn football head coach Tommy Tuberville, who has for years considered entering the political arena, has announced a run for U.S. Senate soon. Sources, who spoke to The Plainsman on background and have worked closely with Tuberville in the past as he considered a run for Alabama governor, confirmed the run Saturday before Tuberville posted an announcement on Twitter. CBS Sports first reported the news. The sources said this is “the real deal” and will be a full-fledged run for the Senate seat currently held by Democratic U.S. Sen. Doug Jones. Tuberville later announced the run on his Twitter feed. “After more than a year of listening to Alabama’s citizens, I have heard your concerns and hopes for a better tomorrow,” Tuberville wrote on Twitter. “I am humbled to announce the next step — I will be a @GOP candidate for US Senate. I invite you to join my team.” In 2017, Tuberville briefly considered a run for Alabama governor but decided against stepping into the political arena. Cindy Murphy, later named Miss Auburn, poses with Bessie the Cow, the winner of the 1979 Miss Auburn election. Bessie the Cow for Miss Auburn campaign posters from 1979. Bessie the Cow, the winner of the 1979 Miss Auburn election, poses for a photo. plan under wraps. The following week, the pair unveiled the new candidate to the rest of the team, and they were beside themselves laughing. The campaign team spent that night plastering the face of Bessie, better known as No. 18 to the vet school, all across campus. Butgereit thought campus would get a good laugh, and she imagined it would stop there. It’s been a little more than a month since a devastating EF4 tornado ripped through the Beauregard community on March 3, claiming the lives of 23 people and injuring dozens more. The recovery process is well underway for some of the at least 300 families whose homes were either severely damaged or destroyed. For others, though, the process has barely even started. “The recovery process has been slow,” said Granadas Baker, a resident of Beauregard whose mobile home was severely damaged by the storm. “Insurance is dragging their feet.” With little notice before the storm hit, Baker, his wife and three of their children rode it out in the bathroom of their home. “I thought we were going to die, literally,” Baker said. “But once I was knocked back, it was just so calm. I just felt the greatest calming over me. I was just watching all of the insulation fly around. It was just the insulation and wood and stuff was everywhere.” Part of the insulation and wood came from his family’s home, which was rendered uninhabitable by the storm. Their home of 16 years was essentially destroyed. fected by the storm could seek support from FEMA, the Lee County EMA, the Alabama EMA and the Small Business Administration. FEMA has said it received more than 600 applications for assistance. The federal agency has approved more than $900,000 in aid to those affected by the storm. Baker said the problem has not been so much with FEMA, but confusion over the process of waiting on insurance and when to move forward with FEMA for federal aid. “That was my issue, knowing what steps we take once our insurance does whatever it’s going to do,” Baker said. “That was the main thing, and we really couldn’t find anybody that could tell us, and we finally got somebody who could tell us that yesterday. Now, you know, we have an idea of what our next step is and how the process is going to be.” In the meantime, as the Bakers wait on their insurance to come through and for help from FEMA, a community organization has stepped in to help. The East Alabama Medical Center Foundation is paying for an apartment for the family. “Lives were lost, of course,” Jones said. “Properties damaged. Whole residences, years of family history gone in just a few minutes. It’s going to be a long process.” When they do get their money situation figured out, Baker said he and his family plan to move back to Beauregard. seat will be held in March 2020, and the general election is set for Nov. 3, 2020. Tuberville said he is ready to run against Jones. “We had a person get elected into the Senate I don’t feel like covers the needs of this state or this country,” Tuberville said on the show. The CBS Sports report said former White House press secretary Sean Spicer is working on Tuberville’s campaign. Tuberville had a long coaching career at Ole Miss, Auburn, Texas Tech and finally at Cincinnati, where he ended his time as a coach. After months of postponement on an issue that required expedited fixing, the City Council has once again given constituents in Northwest Auburn a plethora of reasons for outrage. Residents wanted an ordinance that would prevent student housing from being built in long-standing, historically black and traditionally single-family neighborhoods. They didn’t want to be encroached upon by houses clearly made and clearly priced for students. They didn’t want to be blocked in by students’ cars on weekends. They didn’t want to have college students as neighbors, who undoubtedly bring with them parties, loud music and other activities sure to disrupt a family neighborhood. They didn’t want to have their property taxes increased to unexpected, unaffordable levels. They didn’t want student houses, which are referred to as academic detached dwelling units in the ordinance, and they didn’t want their neighborhood to become gentrified. Gentrification is simply a respectable word for robbery. Because of what developers have built, the people of Northwest Auburn are being robbed of their homes. They are forced to either bite their tongue and deal with these assured detriments or leave the homes and neighborhood many of them grew up in. Dealing with the detriments, however, is often financially impossible. Thus, the displacement is forced, and their home is taken by the developers’ need to make a quick profit. How else does one label the act of taking something — a home, property, land — from a person? It is robbery, and the Council has just passed an ordinance that will allow the plunder to continue because of the last-second amendments attached to the ordinance. Before explaining the amendments of the ordinance, it’s important to note some members of the Council were clearly confused at the meeting. them, agree to help the residents of Northwest Auburn. Instead, the City Council throws the community they are supposed to protect under the developers’ huge, shiny buses. Maybe the Council believes that what little is left in this neighborhood is not worth saving. In fact, this was one of the many things discussed in their two-hour-long meeting. There are too many student houses on Canton and Frazier already, they said. Tell this to the few remaining residents who are holding onto their historically black neighborhood for dear life. Tell this to the residents who have been robbed by greed, who have been gentrified. If a team was losing and they followed the Council’s logic, then they’d give up because what’s the point? The point is things can change — but not anymore. The second amendment states ADDUs are permitted by right in redevelopment districts east of North Donahue, mainly located along Bragg Avenue. The initial proposal was that they would be a conditional use in RDD. This, again, makes it easier for developers to build ADDUs. What a surprise. Dawson, Ward 4 Councilman Brett Smith and Ward 3 Councilwoman Beth Witten have all been against this ordinance since day one, at least back when the ordinance was actually beneficial to the residents of Auburn. They have been the least sympathetic to the issue of gentrification. This was evident when they each voted in favor of these amendments. This was evident when they voted against the whole ordinance, even if it had their lovely amendments attached to it, because they saw no problem worth fixing. It’s despicable. It’s expected. And that’s the tragedy in all this. Many dominoes had to fall for us to get here, the first being Auburn University’s unwillingness to house students at an affordable price. The University, our city government and the developers who say there’s no gentrification should be ashamed. We dare you to look these residents in the eye and explain to them why their homes, their neighborhoods, their place in this city is meaningless, because that’s the message being screamed in their faces right now. 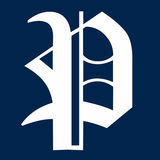 OPINION PAGE POLICIES The Auburn Plainsman welcomes letters from students, as well as faculty, administrators, alumni and those not afﬁliated with the University. Letters must be submitted to editor@theplainsman.com before 4:30 p.m. on Friday for publication. Letters must include the author’s name, address and phone number for veriﬁcation. Submission may be edited for grammar, style and length. Please submit no more than 600 words. COLUMNS & EDITORIALS The opinions of The Auburn Plainsman staff are restricted to these pages. This editorial is the majority opinion of the Editorial Board and is the ofﬁcial opinion of the newspaper. The opinions expressed in columns and letters represent the views and opinions of their individual authors. These opinions do not necessarily reﬂect the Auburn University student body, faculty, administration or Board of Trustees. quire amending the Constitution, which is extremely difficult to accomplish. In order for an amendment to pass, it must be ratified by two-thirds of both the House of Representatives and the Senate, and then threefourths of the states have to affirm it. Considering the Democrats do not hold a supermajority in either chamber, it is highly unlikely that abolishing the Electoral College will ever happen. The Founding Fathers established the Electoral College for a reason. They did not want for any area of the country to be overshadowed in elections and the Electoral College ensures that doesn’t happen. Maggie Smith is a junior in agricultural communications. Morgan Kull singing the national anthem at the Final Four game in Minneapolis, Minnesota, on April 6, 2019.
dium a few times, and everything went according to plan — no misplaced words. With one of the student-athletes playing the guitar, their “campfire version of the national anthem” was somewhat controversial on social media. “They were like, ‘What are these 20-year-olds doing, changing our national anthem?’” Kull said. But she just thought it was funny. “It wasn’t as bold as Fergie’s,” Kull said. “We still stuck to it more than her.” Although she was singing in front of nearly 70,000 and millions more at home, Kull was more excited than nervous. “The thing is, I can’t really comprehend that number at all, so I couldn’t even get nervous about it because I just didn’t understand,” Kull said. She said it helped a lot that she’s gotten accustomed to performing in front of people in her own games, and in some ways, it was easier. She said in games, you don’t know what’s going to happen, but for a performance like that, you practice and know exactly what is going to happen. Kull has never really considered singing as a career; it’s just something she’s always enjoyed for fun. With volleyball, it’s difficult to keep it up because her voice is usually gone during the season, but she is hoping she’ll be able to take a music class in the spring after her senior year. The NCAA had a Minneapolis Air Force sergeant sing for the national title game, so Kull would not have had another opportunity if Auburn had won, but either way, she said it was a once-in-a-lifetime opportunity. bility limitations. They will also start therapy gardens, hoping to partner with Student Veterans and the Eagles Program. “We want to cater to each group and what their needs are,” DeVore said. DeVore encourages students to garden. “I think students should join the garden because it’s a great opportunity to enjoy the outdoors and connect with your food,” DeVore said. “Growing vegetables is hard work and requires a lot of discipline, and I think when you put in all that work, you gain an appreciation for your food.” The gardening season has already begun but is still welcoming members. incredible experience that is being stripped away from Auburn students for no reason. I feel as if the organization is equally as important to students as it is to prospective athletes and their families.” The new SEC legislation will be effective on Aug. 1, 2019. Some current student athletic recruiters feel sad to see the program end. “I think it is unfortunate because SAR has been a huge part of my college experience,” said Alisa Mobley, a third-year athletic recruiter. “I have had so much fun these past three years, and I am sad that other students won’t be able to take part in the organization.” In previous years, a new group of student athletic recruiters would currently be anticipating the fall semester. This fall, there will be no group to take up the mantle. “Fall 2019 will be my last football season as a student, and I will miss helping the recruiting staff and interacting with the recruiters and their families,” Mobley said. to be towed, as well. Another bus was brought to the scene to take students to campus. No injuries were reported. “He probably wasn’t going any faster than 30 because he had just pulled out,” Sheffield said. “I mean his foot was on the gas, so he was accelerating. The whole bus was shook. It was kind of like a jerk, a shake. His car is totaled, and he damaged the bus pretty bad. It was a pretty hard hit.” Another Tiger Transit was rear ended on Monday. Andrae said the footage from the bus showed a van drive into the back of the bus. No injuries were reported, and the bus was able to keep driving on the route. Andrae said having 57 buses on route, there are bound to be accidents, but he is glad neither of the accidents were caused by Tiger Transit employees. Lorenzo Dorsey, Auburn Police Division captain, told The Plainsman the cause of the wreck remains under investigation by the police. Tiger Transit buses line up on Tuesday, Sept. 19, 2017, in Auburn, Ala.
CAREing Paws members pose with therapy dogs. day. That’s where the whole animal-assisted therapy comes in.” CAREing Paws has a monthly meeting every first Monday of the month. Miller and Choa come to every meeting, and members are able to spend time with the dogs. At these meetings, members discuss logistics and events that are coming up for the month. Mcatee said anyone is welcome to join, and anyone can become an officer in the club. “A lot of people think this is a nursing school requirement or that you have to be pre-vet to be in the club, but we want everyone,” Mcatee said. He said he believes students should join so that they can see the impact of service dogs first hand at the different sites they visit. “I think it’s whenever you go to the nursing home, that’s whenever you see the true impact these dogs have on people’s lives,” Mcatee said. Mcatee also said that Auburn’s nursing school is the only nursing school that emphasizes animal-assisted therapy and teaches classes based on the effectiveness of this concept. Any student can take the animal-assisted therapy class for two credit hours, and interested students can email Pope for more information. The organization will also be at the Vet School during Wellness Week during the week of April 25. “A lot of these residents had to give up their dogs, or they had dogs that passed away, so whenever you see the impact it has on the residents, it just changes your mind completely and makes you want to go out every single week,” Mcatee said. Auburn Circle Be the first to see the spring issue of Auburn's literary magazine at SNAPS. Monday, April 15 7 p.m. in the Red Barn Get your free copy at SNAPS or Tuesday-Thursday from 9 a.m.- 2 p.m. on the Haley Concourse or Student Center Transit Stop. Miranda Morrow holds a stuffed animal at EAMC. Hickoy Dickory Park in Auburn in May 2016.
tection from the enemies of foreign nations. The children of the town are careful to jump and leap without touching its boiling surface. A winding moat flows throughout the kingdom, full of mermaids and other colorful sea life. “You have to jump high enough from one part to the other part to not fall in the lava,” said 7-year-old Brealey of Opelika. “One person at the top tells the other person at the bottom where to hide before the tiger comes and gets you.” It’s not a royal intercom system, but close enough. Stairs wind through the castle uncovering hidden rooms and passageways. The castle’s openness allows for people to gather in the main ballroom to mingle and laugh, hoping to catch a glimpse of the princess roaming the halls of her palace. The park has an enormous grassy area that is perfect for all activities. Picnic tables scatter the open area for parents to watch as their children run and play until their hearts are content. Brealey’s mom, Liz, said the seclusion of the park makes it feel very safe. With everything being so close together, she can watch her daughter play and know where she is at all times. “It’s a great place for families to come,” Liz said. “We have been coming here since Brealey was little, and my 70-year-old mother has been down those slides, so I know they’re durable.” Hickory Dickory Park is Auburn’s biggest playground, drawing in residents throughout the community. Renamed from Hickory Lane Park in 1999, its original design makes it popular. “The park was built by the community through donations and actual labor, so there are many in the community that have a connection to it,” said Auburn Parks and Recreation Director Becky Richardson. Since its creation, the Auburn Rotary Club has dedicated a volunteer-based work day each year to help replacemulch, spray the wood of the playground and any other small repairs needed. So maybe the enchanted forest is really just a thicket of woods at the end of a cul-de-sac, and the whispering trees only know about the barking dogs and car alarms going off in the neighborhood. Maybe the roar of the dragon is the sound of a revving Ford F-150 engine. And maybe the lava filled barrier for protection is just hot mulch heated up from the warm sun, and the mermaid-filled moat of sea life is only a mural canvassing the entirety of the base of the playground. The roars in the distance of mythical beasts may not be so mythical after all, considering it is actually the buzzing of Shug Jordan Parkway at quitting time. The main ballroom is a mid-level platform with seating for parents to watch and children to rest, while the square down below flourishing with business is actually just a pretend Toomer’s Corner area where children can sell ice cream and lemonade. The College Street replica is complete with tiger paw prints and cut outs for children to fully get into character. Regardless of whether someone sees a dragon or a truck, the mermaids or the lava, the fairytale kingdom or a neighborhood park, Hickory Dickory Park will continue to be a place where children from all over are able to let their imaginations wander. One staple of the recently revitalized downtown Opelika area is turning four and is adding to their business. Red Clay Brewery, which has beer available throughout Alabama and Georgia, is now expanding its line of canned beers as they bring their canning in-house, said John Corbin, co-owner and founder of Red Clay. “We’re going to be releasing some fun beers locally,” Corbin said. “We’ll have some cool stuff that we’re going to release state wide and throughout the region. We’re also going to be releasing some stuff that you can only get here locally.” Corbin, who began Red Clay with Stephen Harle and Kerry McGinnis, is hoping to expand their can run further over the next few years. In the meantime, Red Clay has expanded its brewery in Opelika with a new back patio. The large, fenced-in space has room for patrons to spread out a blanket or sit at one of the picnic tables as they sip a beer. The space is dog friendly and will soon feature an outdoor bar, Corbin said. “We’re planning on doing a bunch of weekly bands out here,” Corbin said. “We’re opening it up to do some music. We’re putting a bar out here and all that stuff. It’s going to be fun.” Families with children young and old joined Red Clay on Saturday to celebrate the brewery’s four years in Opelika. Many patrons used the outdoor space to enjoy some of Red Clay’s brews while snacking on treats from local food vendors. GREYHOUND.com to purchase tickets and for the address of our location. The entrance of Bow & Arrow on Nov. 2 in Auburn, Ala.
Beer taps at Red Clay Brewery on Friday, April 6, 2018, in Auburn, Ala.
letic trainer coach Damon and Clark!” Harper wrote. “You guys were key for me never missing a game at Auburn and always having me prepared to compete at the highest level every game.” As the unquestioned leader of Bruce Pearl’s runand-gun Auburn offense the past three seasons, Harper averaged 13.5 points and 4.8 assists per game. This season, he averaged 15.3 points and 5.8 assists in arguably his best year. “With the support form our coaching staff and my family, I have decided to chase my lifelong dream of playing in the NBA,” Harper wrote. “I have decided to forego my senior year and declare for the 2019 NBA draft and sign with an agent. Again, thanks for the continued support and prayers as I transition to the next journey of my career.” Harper was named to an All-SEC team twice and is one of two players in Auburn history to record 1,200 points, 450 assists, 350 free-throw makes and 200 rebounds after Eddie Johnson in 1973-77. He’s just one of five players in SEC history with 1,400 points, 500 assists and 200 3s in a career. Bryce Brown was trying to foul. The senior guard swiped at Virginia’s Ty Jerome as Jerome brought the ball up the floor with Auburn leading 62-60. The officials swallowed their whistles and let them play on. Jerome then lost the ball off his own foot, but instead of stopping his dribble and making a pass, he picked the ball up and advanced to the frontcourt. The rest is history. On a last-second 3-point attempt, Virginia’s Kyle Guy was fouled by Auburn’s Samir Doughty. Guy sank all three freebies to lift the Cavaliers to the title game and send the Tigers packing. The NCAA issued a statement on the foul call against Doughty, but most fans realized that it was the correct call because Doughty took away Guy’s landing spot and bumped him as he shot. Fans wanted the double-dribble addressed. The statement for that never came. Auburn head coach Bruce Pearl, along with the rest of his players, were gracious in defeat after the game, blaming only themselves, not the officials. Bryce Brown (2) defends during UVA vs. Auburn on Saturday, April 6, 2019, in Minneapolis, Minn.
post-national championship top 25 in 199394. After a 2-4 start in SEC play spelled frustration on The Plains, Auburn went on to win its first SEC Tournament title since 1985. The Tigers earned a 5-seed in the Midwest Regional of the NCAA Tournament, holding off New Mexico State in a thriller before becoming the first team in college basketball history to beat the three winningest programs in the sport — Kansas, North Carolina and Kentucky — consecutively en route to a Final Four showdown with would-be national champion Virginia. Auburn fell in the final seconds to Virginia after the Cavaliers’ Kyle Guy was fouled by Samir Doughty on a 3-point attempt. The Tigers finished the season at 30-10, their first 30-win campaign in school history. Bruce Pearl during UVA vs. Auburn on Saturday, April 6, 2019, in Minneapolis, Minn.
Samantha Cerio reacts after her uneven bars routine at Auburn Gymnastics vs. Kentucky at Auburn Arena in Auburn, Ala. on Friday, Jan. 26, 2018. Tannon Snow hits during Auburn softball vs. Western Illinois on Sunday, Mar. 4, 2018, in Auburn, Ala.
After helping Auburn secure its first series win at Tennessee since 2002, Tannon Snow earned SEC Player of the Week honors. Tuesday. Snow slashed .667/1.889/.700 in the series to help the Tigers secure the series victory with two wins. She finished the series with six hits in nine at-bats, three home runs, seven RBIs and four runs scored. Snow is currently on a 15-game on-base streak, which is a career-high, and she’s tallied a hit in 17 of the last 21games. Snow had a career night in the first game of the series, going 4-for-4 at the plate with two two-run homers and seven RBIs. This was Snow’s second game of the season with two home runs, with the first coming against Furman on Feb 17. The four hits and seven RBIs also marked a career high for Snow. “I thought Tannon played, all-around, exceptionally well,” said Auburn head coach Mickey Dean. “She was a mainstay for us on defense — making some great plays — but she was also consistent (at the plate) the entire weekend. She had a great first game, with the seven RBI, but just had a great series hitting the ball throughout the entire week. She seemed extremely comfortable the entire weekend, which was nice to see.” Snow’s career day made her the first Auburn player with a seven-RBI game since Kasey Cooper did so April 17, 2016, against Arkansas. She was also the first Auburn player to finish with four hits in a game since Kendall Veach had four Feb. 8 against Tennessee State. During the second game of the series, Snow marked her 100th career collegiate hit after a solo home run in the second inning. She added another hit during the next game to push her total to 101, and 71 as an Auburn Tiger. She had 28 at Washington before transferring. Double Meat based on average 6” sub. Subway® is a Registered Trademark of Subway IP Inc. ©2018 Subway IP Inc.
Jennifer Levi, Auburn graduate, posed for a photo in the Glomerata. AnnaLevi Chavis, junior in anthropology, poses with her mother Jennifer Levi, in Auburn, Ala. Whether it’s from movies, books or television shows, fictional characters have a way of enchanting audiences, and some people become those characters through cosplay. Robert Anderson, senior in business administration, said the origin of the word cosplay comes from the two words costume and play. Jasmine Smith, sophomore in architecture, said cosplay is dressing up as a character as a hobby and in some cases also acting as the character. “It’s a creative outlet because you see a character that maybe you idolize, and you’re able to bring that character to life,” Smith said. Smith said once she finds a character how she starts the process can depend on what supplies she already has. “When I wanted to cosplay Batty Koda from FernGully, for example, I didn’t have anything,” she said. “So, I started with the ears first because I felt like if I started with something that I could purchase from somebody, I could move on to the actual making of the costume, which was a lot of planning.” Anderson said he will usually try to break it apart. and $5 for non-members. When working on a cosplay, they both said it is important to know when to take a break. “You will reach points of frustration when you will have a mental breakdown,” Smith said. It’s important to sometimes step back, take a deep breath and walk away for a little bit, she said. When trying to keep on a college budget with cosplaying, thrifting, sales and craft stores are helpful, Smith said. “Thrifting — thrifting is your friend,” she said. With thrifting, people don’t have to use the whole piece of clothing; it could just be a part of it, Smith said. “Don’t be afraid to tear up a piece of clothing that you get at a thrift store to piece with something else,” said Leila Martin, sophomore in economics. It is also easy to get focused on wanting to be as accurate as possible. But it doesn’t have to be that way, Smith said. Martin said people don’t have to cosplay as someone as the same gender as them, and they all said people don’t have to cosplay as a character with the same body type as them. It can be anyone they want. “The whole point of cosplay is to have fun and enjoy what you’re doing,” Smith said. STAFF REPORT The next generation of fashion designers showcased their latest work, giving the audience the experience of Avant Garden. The College of Human Sciences’ department of consumer and design sciences, the Auburn Apparel Merchandising and Design Association and Mint Julep Boutique hosted the annual Fashion Event last Thursday. The show is one of the top college-level productions in the nation and showcases work that is made and modeled by University students. “Since the event is student run, I think it shows great leadership and character of the students who are planning and directing it because they’re willing to put in the time,” said Charlee Vawter, junior in apparel design and production management. Auburn University’s Fashion Event in Beard-Eaves-Memorial Coliseum on April 4, 2019, in Auburn, Ala.
and Hayden Shepherd made their business idea a reality when they moved to Auburn for college and brought their love for vintage clothing to the Auburn community. “The first thing I always notice about somebody is just the way they dress, and to me, style has always been how I express myself,” Tunnell said. 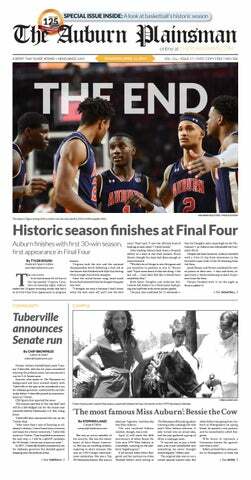 The Auburn Plainsman is not responsible for the content of the ads. Ads that seem too good to be true usually are.